The project was led by Dr Michael Day, a postdoctoral fellow at Wits University, and the findings are contained in paper, titled: When and how did the terrestrial mid-Permian mass extinction occur? Evidence from the tetrapod record of the Karoo Basin, South Africa, published today, 8 July 2015, in the latest issue of the Royal Society’s biological journal,Proceedings of the Royal Society B. 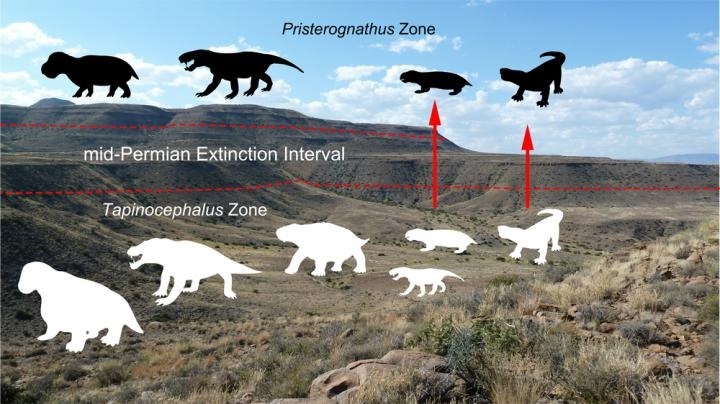 The Karoo is very rich in fossils of terrestrial animals from the Permian and Triassic geological periods, which makes it one of the few places to study extinction events on land during this time. As a result South Africa’s Karoo region provides not only a historical record of biological change over a period of Earth’s history but also a means to test theories of evolutionary processes over long stretches of time. “A mid-Permian extinction event on land has been known for some time but was suspected to have occurred earlier than those in the marine realm. The new date suggests that one event may have affected marine and terrestrial environments at the same time, which could mean its impact was greater than we thought,” says Day. “The South African Karoo rocks host the richest record of middle Permian land-living vertebrate animals. This dataset, the culmination of 30 years of fossil collecting and diligent stratigraphic recording of the information, for the first time provides robust fossil and radioisotopic data to support the occurrence of this extinction event on land,” says Day.